In Moscow, approximately 100 opposition activists have been detained out of the 1000 who took part in Saturday’s iteration of Strategy 31, a series of rallies dedicated to the defense of the constitutional right to free assembly, Kasparov.ru reports. Among those detained are former Deputy Prime Minister and Solidarity opposition movement co-leader Boris Nemtsov and Strategy 31 co-organizer Konstantin Kosyakin. 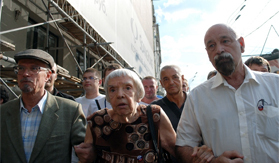 The two other Strategy 31 organizers, former Soviet dissident Lyudmila Alexeyeva and National Bolshevik leader Eduard Limonov, left the square before police were able to detain them. As each of the other Strategy 31 rallies that have been held since the series’ inception one year ago, Saturday’s event was unsanctioned by the Moscow city authorities – thus technically punishable by Russian federal law. As with past events, the mayor’s office denied sanction to rally organizers on the basis that another event was already planned for Triumfalnaya Square, where Strategy 31 is traditionally held. In the past, these events have included sports festivals, “Winter Festivities,” and rallies promoting blood drives by the pro-Kremlin youth movement Young Russia. This time, it was a three-day car show. As oppositionists gathered on Triumfalnaya Square, the sound of skidding tires and roaring motors drowned out all other noise – at the very time of the rally, an improvised race track had been set up to hold a drifting competition. According to Gazeta.ru, no more than 50 people were watching the competition. Given that Triumfalnaya Square is not large enough to hold a drifting competition, the neighboring roadway leading from Moscow’s Garden Ring to Tverskaya Ulitsa was blocked off to give the cars more room. Previously, oppositionists have been criticized by the authorities and their opponents specifically for blocking traffic. In any case, as a result of the barriers, space to walk between Triumfalnaya Square and the bordering Tchaikovsky Concert Hall was so tight that police officers themselves had no space to move around. Therefore, notes Gazeta.ru, it was harder for them to detain rally participants. Strategy-31 co-organizer Eduard Limonov, who has been arrested numerous times and spent 10 days in confinement for organizing an unsanctioned Strategy 31 rally, managed to avoid detention specifically because of the lack of space for the police to move. Surrounded by a ring of six personal guards, the National Bolshevik leader was able to stay at the rally for a full hour before quietly taking leave. Other areas of the square were not as peaceful. Boris Nemtsov was among the approximately 100 detained (by official Moscow city police numbers, 35), and has reportedly been charged with insubordination towards a police officer. Opposition leader Sergei Udaltsov was detained after handcuffing himself to a metal gate. According to Kasparov.ru, police initially tried to detain Udaltsov by physically tearing him away from the gate: “They nearly broke my arm,” he said. After several minutes, police brought metal cutters to sever the handcuffs. Other activists, including some with the opposition art movement Voina, also handcuffed themselves to the gate and were similarly violently torn away by the police. Overall, rally participants and media correspondents noted that the police acted typically violently. Detained activists, blogging over their cell phones in police buses, reported that even young girls were being violently beaten by the police. One Kasparov.ru correspondent witnessed a police colonel punching a female photographer in the back three times over. Upon detention, police reportedly tore off activists’ clothing if the number “31” was written on it. As Gazeta.ru reports, the police charged with dealing with the squished mass of activists between Triumfalnaya Square and the Tchaikovsky Concert Hall at one point formed a human chain (made up largely of more full-bodied officers) and began squeezing the rally participants towards a nearby metro entrance. The force of this chain was so great that some police reportedly let out some of the female activists who were screaming in pain. However, instead of pushing the crowd into the metro, the police ended up pushing the crowd toward the neighboring Theater of Satire. In result, the glass facade of the theater shattered, injuring a soldier and several other people. According to Moscow City Police spokesman Viktor Biryukov, the soldier was injured only after a female opposition activists pushed him. “In result, the soldier fell to the ground and was wounded in the face by the glass,” he said. The last of the Strategy 31 participants dispersed around 8:30 pm. Many of them went to rally outside of the various police stations where detained activists were being held. At about this time, State Duma Deputy and Young Russia leader Maksim Mishchenko showed up in a black dress jacket and began to give a fiery speech about the “evil empire” that he believes the United States to be.